Monet, Renoir, and the Impressionist Landscape beautifully illustrates the rise of landscape painting as the dominant genre of the avant-garde—one of the great dramas of 19th-century painting. Throughout art history, landscape paintings were considered less ambitious than history paintings or portraits. Between 1850 and 1900, however, artists introduced exciting innovations in the art of landscape. Landscape paintings were increasingly in demand by middle-class patrons wishing to decorate their urban apartments with pictures of the countryside. From Jean-François Millet to Vincent van Gogh and Monet, artists sidestepped the centuries-old tradition of history painting. Instead, Monet focused on modern values of color, light, and brush stroke. SPECIAL NOTE : The painter will make the reproduction as close to the original oil painting as possible. 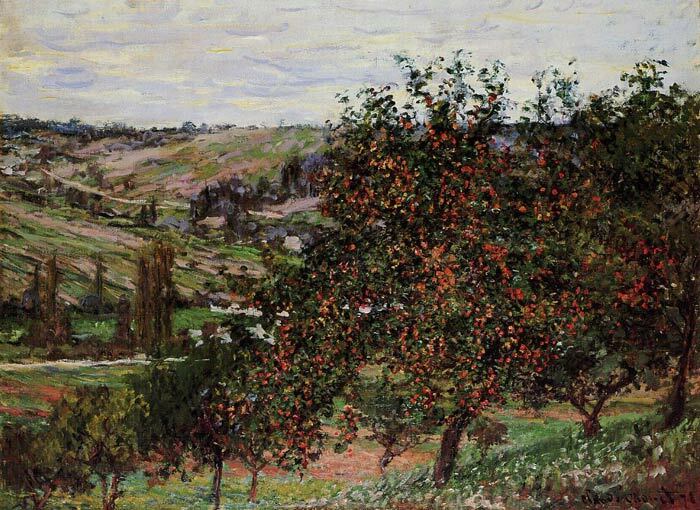 If you want your painting to alter from this likeness, please email us and " Apple Trees near Vetheuil , 1878	" will be reproduced according to your special requirements.